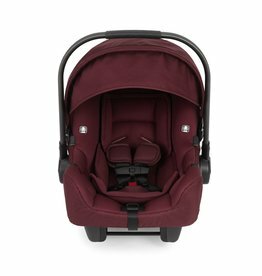 NUNA Rava- Convertible Car Seat - EcoBaby Gear, Inc. The RAVA is simply smart. It is uncomplicated and unfussy. You only have to make one car seat purchase with Nuna’s new RAVA convertible car seat because it will safely accommodate the littlest of babies - 5 lbs to start. Most babies will outgrow an average car seat by one year. If your lifestyle doesn't require you to use a portable car seat, start with the Rava. When you take your baby out of the car, simply carry them in a baby carrier or maybe they are ready for the stroller seat. Nuna has a fantastic stroller called the MIXX that you can recline the toddler seat and or you could add a bassinet. Once your little one has good upper body and head control they may be ready to transition to the stroller system. Seat pad is easy to clean, machine wash cold, lay flat to dry. RAVA exceeds American safety standards for car seats. Fuss-free adjustments make this easy for parents to accommodate growing baby.